Is Your Web Content Too Smart for Its Own Good? When writing content for their website, business owners sometimes face something of a dilemma: Should the content be written at a high, sophisticated level, demonstrating an able use of industry-specific lingo and terminology? Or, should the content be “dumbed down,” made more accessible to lay people and average readers? This is a question that most any business owner should be asking, but especially those who work in fairly technical fields. What an animal groomer or a fitness instructor does is fairly relatable to everyday Web readers, but what a telecommunications company, a law firm, or even an online marketing company offers can be a bit more muddied by jargon and technicalities. Generally, though, the answer to the question at hand—exactly how smart should your Web content be—is one that requires some balance. On the one hand, it is important to demonstrate a command of your field, which requires a certain level of sophistication. At the same time, sophistication becomes a detriment if it means your potential customers have no idea what you’re talking about! There are a number of formal tests that can be used to evaluate the approximate ease of readability—the “reading level”—of your Web content. You can access some of those tools, and use them for free, at this site. Note that some versions of Microsoft Word also offer these features, under the Spelling/Grammar section of the Review tab. Finding the reading level of your website content can be helpful. If the score you get is a 4, that means your content could likely be understood by a fourth grader; a 13, meanwhile, corresponds with a college underclassman. Do you hope to see a high number, or a low number? There’s no easy answer here, though there are cases to be made for both. High numbers come with one major advantage, which is that Google tends to favor more sophisticated writing. All else being equal, a college-level website is likely to win more search engine favorability than a third grade-level website. Here’s the problem, though: The average reading level among adults in the United States is a mere seventh grade, and a full 20 percent of all American grown-ups cannot read below a fifth grade level. The question, then, isn’t so much how smart should your website be, but who are you writing for? The answer is one that virtually all online marketing professionals—including us at Grammar Chic—can agree on: You should be writing for human readers first and foremost, with search engines coming in a distant second. Does this mean that you need to water down your Web content and use only one-syllable words? By no means! 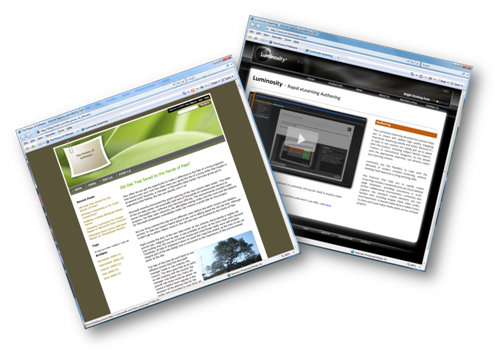 Your business website must be professional, and it must display a strong grasp of your field. If you write like you’re just a novice or an amateur, that’s exactly how you’ll be perceived. At the same time, though, making your content too erudite runs the risk of alienating those who might otherwise become your customers. Conveying intelligence is crucial, but it is just as crucial to do so in a way that appeals to different readers with different backgrounds. A lawyer needs for her website to convey a certain respectability, for other attorneys who visit the site, but also a layman-level accessibility that can resonate with potential clients. Does this mean there is a magic grade-level number you need to hit? Not necessarily. It’s simply important to seek a balance of sophistication and clear, simple communication. To learn more about how this might be done, we invite you to connect with Grammar Chic, Inc. today: Visit www.grammarchic.net or call 803.831.7444.